Origen Architects work with clients to design architecture, urban design and interiors that combine together the environmental, economic and social aspects into a cohesive whole or green building. Green building is slowly becoming a reality but the next challenge is for green building to be transformative, evolving into a living building. The next leap forward for architecture is to design built environments that become living entities together with their surroundings, taking from and giving back to their environmental, economic and social context. Our design process to create a living building evolves from the interaction of the accepted 'elements' of sustainability, such as water, energy, light /colour and materials, for design purposes, interacting wholistically into a matrix of sustainable 'actions' of mutual influence, where each 'element' informs the other(s). Defining the brief is the first step and a prelude to designing the building. Designing is a verb, an ongoing process. For example designing a sustainable building will be a continuous 'journey' not a destination. Like all 'journeys' one needs a map, an idea of how to get 'there'. The first step is to workshop with the client to arrive at a 'mind map' of the sustainable 'action' activities such as renewing, restoring, recycling, and then linking them with the 'elements' of sustainability such as energy, environment, water, waste, materials etc. This approach is an Origen Architects trademark. 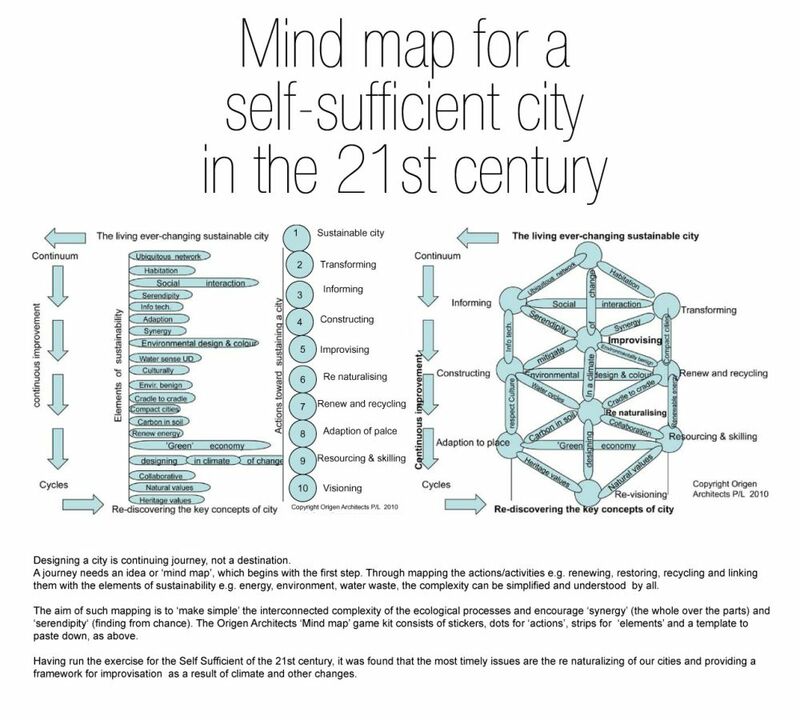 The aim of such 'mind mapping' is to make simple the interconnected complexity of ecological processes and encourage 'synergy' (the whole over the parts) and 'serendipity' (a finding from chance). This mind mapping is a collaborative interactive exercise of arranging and rearranging sustainable 'actions' and 'elements' within templates to find the key sustainable issues, which will give maximum benefit. Once the mind map is derived, the design journey can begin through the familiar processes of, concept, design development, working documentation and procurement processes. Origen Architects uses 'Archicad' building information model (BIM) software to collaborate with engineers and others such as a model maker, as required. The virtual model is evaluated using Eco Designer and MEP software as part of our best practice sustainable design method.